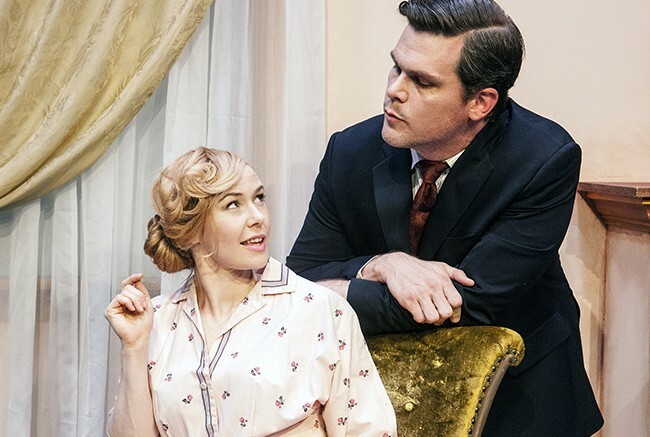 Capital Stage’s production of “A Doll’s House” brings the play from 19th century Norway to 1948 America and from a simple drama to a suspense thriller where the audience plays the part of voyeurs. The production was directed by American River College theater professor Janis Stevens and was adapted for the stage by Stephanie Gularte after originally being written by Henrik Ibsen in 1879. The layout of Capital Stage allows the audience to be in close quarters with the performers, and while most theater audiences will find themselves far away from the action, attendees of “A Doll’s House” will feel as if they are flies on the wall, spying on the domestic problems of this upper class family. Both stories feature a main character who justifies unethical decisions because the decisions are means they use to protect their families. The story of “A Doll’s House” features a female protagonist, Nora (played by Brittni Barger), who is the wife in a patriarchal household. Before the play begins, Nora borrows money from her husband’s co-worker, Nicholas (played by Chad Deverman), for her husband’s medical treatment. Nicholas blackmails Nora once he discovers that she forged the signature on her loan. While this aspect of the story may seem like an anachronism to a modern day audience, it was once hard for women to get loans because it was considered taboo for them to be working. While audience members who are already familiar with the play might remember the story largely centering around Nora’s character development from one who is almost like a child to an adult comes to control her own destiny, the Capital Stage production becomes a thriller similar to the of the films of Alfred Hitchcock the moment that Nora is blackmailed. Nora’s crime instantly becomes the elephant in the room, which causes awkward moments to ensue. Berger’s performance is similar to that of Bryan Cranston’s performance in “Breaking Bad” in that her interpretation of Nora is that she is hilarious, but that she does not recognize this trait in herself. The audience erupted in laughter, despite the seriousness of what was going on. While it is a joy to watch the tension unfold as Nora attempts to keep her transgression a secret, the real magic transpires when watching the actors perform with each other. With the creative decision to change the time and location of the play, the believable performances that each actor brought to the production, and its unique venue, “A Doll’s House” presents an interesting journey of discovery of finding out who these people are and what they are afraid of. “A Doll’s House” will be performed through Nov. 22. Be the first to comment on "Review: Capital Stage theater transforms “A Doll’s House” into suspense thriller"